Preparing blind and visually impaired youth for a brighter future by gaining life skills, work experience and community involvement. 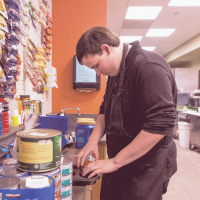 LEAP provides blind or visually impaired youth the opportunity to gain the skills needed to become independent, confident, and productive with the outcome of increased employability. Begin your journey to independence. LEAP offers three and seven week residential summer work based programs in which students live in college dormitories and practice independent living skills. LEAP also offers workshops throughout the year focused on teaching self-advocacy, job skills, assistive technology, and more. Who can enroll in LEAP? Young men and women ages 14-24 years old who are blind or visually impaired. We are also accepting applications from out of state members! LEAP provides year round work shops and intensive summer residential experiences which includes living in community housing while focusing on independent life skills, leadership, and gain work experience. Learn more about the different programs offered to find out which experience might be best for you! Dates are July 21th- July 26th, 2019! See downloadable materials below to apply today! Dates for Session 1: June 22nd-July 11th, 2019 and Session 2: July 14th-August 1st, 2019! Running from June 22nd-August 1st, 2019! LEAP hosts three Professional Growth Retreats during fall, winter, and spring. Each retreat focuses on a specific theme of professional development. Past Retreats have included Workplace Relationships, The Resume, The Interview, Storytelling, Technology and Transportation, and more. Join LEAP for a Ski and Snowboard weekend with USABA and Vermont Adaptive Ski and Sports! This is an opportunity to connect with people who are blind and visually impaired from around the country, and adventure on the mountain. Students will practice communication, independence, goal setting and networking skills. Please see retreat materials below! Come to our first ever camping retreat with LEAP and Vermont Adaptive! Join us for creative problem solving and team building through a fun and meaningful outdoor experience. Students will build skills while biking, hiking, kayaking, and cooking meals over a campfire. Find out what our past students have to say about their time at LEAP. In 1936 the Randolph-Sheppard Act (20 U.S.C. Section 107 et seq.) established the Randolph-Sheppard Vending Facility Program, more commonly known as the Business Enterprise Program (BEP). Here in Vermont, the Division for the Blind and Visually Impaired (DBVI) is the state licensing agency administering this program. BEP is a self employment program. The federal and state laws governing this program require that candidates are to be legally blind, a U.S. Citizen, and must complete our training program. Licensed Operators are trained to run one of DBVI’s food service facilities as self-employed entrepreneurs, keeping 100% of the profits! 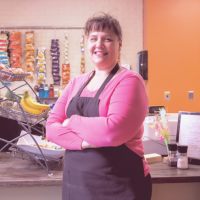 Our facilities consist of cafe and vending machine operations, located in federal and state building throughout Vermont. Qualified candidates are assigned to facilities as they become available.